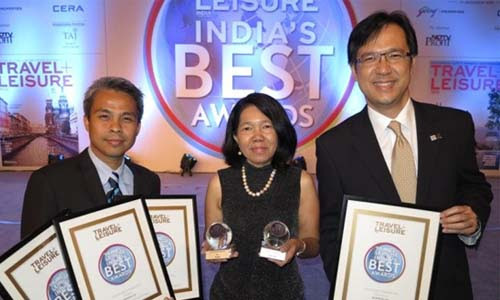 Thailand was recently named the world’s Best Wedding Destination by Travel + Leisure India & South Asia, marking the third year in a row that the magazine has honoured its Southeast Asian cousin with the accolade. Readers of the magazine cast their votes over a period of five months last year, with the results announced in New Delhi last month. Thailand also received a Best Country award from the publication. Feedback from Indian visitors highlights Thailand’s alluring tropical climate, world class accommodation choices and hospitable people as reasons why the country is so attractive. “Every year over 100 Indian weddings are held in exotic Thai locations,” commented Runjuan Tongrut, director of the New Delhi office of the Tourism Authority of Thailand (TAT). “Other Indian high-octane celebrations; such as birthdays, anniversaries and graduation parties as well as family reunions are a common feature in Thailand,” she added. Last month, the TAT offices in New Delhi and Mumbai organised the “Wedding Planner Trip and Symposium 2014” exhibition. Over 40 senior executives representing Indian wedding and events companies attended. The event aimed to promote India’s knowledge base of Thai hospitality operators and services. India is currently one of Thailand’s fastest growing source markets. Last year, a total of 1,049,856 Indian visitors made their way to the Kingdom’s tropical shores, a growth of 3.6 percent on 2012’s figure. This year, the TAT has predicted that 1,070,000 Indian visitors will generate approximately THB45.8 billion (US$1.4 billion) in tourism revenue for Thailand. Data also shows that destination hotspots for Indian visitors in Thailand include Bangkok, Phuket and Koh Samui, with an increasing number also heading to mainland coastal destinations like Krabi and Hua Hin. In addition to weddings, golfing is also a popular pastime for Indian holidaymakers in Thailand. Islands like Koh Samui and Phuket boast several world class golf courses, many of which feature stunning sea views. Cultural attractions are also popular, with many Indian tourists now heading up to the northern region of Chiang Mai to take in some of the Kingdom’s impressive ancient temples. One reason Thailand has become such a popular wedding destination for Indian visitors is because of the range of accommodation options available. Not only is the country now home to some of the world’s most reputable hotel chains; a wide selection of luxurious private villas also provide the ideal venue for large gatherings. With many guests to cater for, Thailand’s private villas offer plenty of private communal space for the celebrations to take place and a number of properties boast as many as ten bedrooms to accommodate the bride, groom and their immediate family.